Montréal–Trudeau provides border preclearance for passengers bound for the United States. 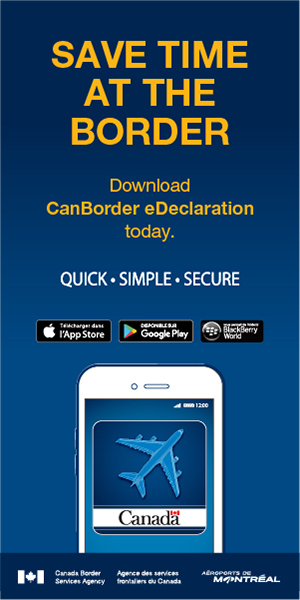 This means that you will be screened by a U.S. Customs and Border Protection (CBP) officer before departure, and will not have to submit to any other formalities when arriving in the United States. You must have all the required documentation with you, including a valid passport. Note also that you cannot take certain products, such as fruit from other countries, into the United States. Present your documents to the CBP officer. Passengers holding a passport from another country must follow the usual procedure and manually complete Declaration form 6059B. NEXUS and Global Entry members enjoy the advantage of having access to a special express line through security checkpoints and in the U.S. border preclearance area where they can use Automated Border Control kiosks. Note that in all cases, CBP officers are empowered to request a secondary inspection. You will be directed to an adjoining room and, if need be, your checked luggage will be recalled. For more information, see the U.S. Customs and Border Protection Web site. As part as the Cannabis Act, in effect as of October 17, 2018, passengers should visit the Government of Canada site for more information on cannabis guidelines and travel abroad.